Why Higher eBook Prices AREN'T the Indie Holy Grail. I know, I know, we're all in this together, but sometimes we kind of insulate ourselves in supportive communities of back patting and commiserating and we lose perspective and start treating ourselves and other authors as special snowflakes who really should never be questioned and who are owed successful careers because we put so much heart and soul into our work, and heart and soul should be rewarded. So occasionally I take other authors to task on things like our reaction to bad reviews, our unwillingness to discount our work, and being lazy about spelling and punctuation ... among other things. These rants are cathartic to me, and I fully acknowledge that in my own dark moments I have sat on the floor lamenting how a reviewer didn't understand me and my artistic vision or how dang hard it is to even make a part time income in this business. However, after a close friend or perhaps my husband has listened to me sob about it for a few minutes, it is important to pick myself up and move on. Not make memes about how terrible readers, reviewers, Amazon (take your pick) are. One thing authors like to whine ... er ... take issue with, is the low price of books. This specifically deals with ebooks which are the money makers for most indies. I know a few self-published authors and small press authors who make more money from the print side of things, but they tend to be the exception. Also, my ebook prices are set at $2.99 and my paperbacks are set (most of them) all above $7. Which would you guess I make more money from? If you said ebooks, you'd be right. Of that $2.99, over $2 goes directly into my pocket (not counting any publication expenses like cover art and editing, but those are one time expenses, not ongoing things). Depending on where you buy the book (different stores take different cuts out of my profit margins), I make anywhere from $2 to a measly 25 cents on my paperbacks. However, there is a threshold for what readers are willing to pay for an ebook. One survey suggested that the top price most readers are willing to pay is $4.99. Recently in a group, someone told me they were relieved that readers were starting to be more accepting of higher prices, and they hoped the trend continued. However, is it really? Will higher prices on ebooks (which presumably are not getting any more expensive to produce. If anything they are less expensive as more options become available for cover art and more authors learn to do their own basic formatting rather than hire it out) really help authors stay in the black in the long run? The thing is, upping our book prices doesn't necessarily mean readers will spend more on books. I think writers forget that readers' pocket books aren't an endless resource. Which is strange because presumably many of us are readers ... and also presumably not wealthy, considering our chosen vocation. Yes, I've been the reader who isn't to be trusted in a book store, who hoards books like a greedy book wyrm (dragon), but now I'm the reader with a tight budget, a mortgage, and unexpected expenses that fly at me like jump scares in a horror movie. I have at most a couple dollars here and there to spend on non-essentials, and I think that's true of a lot of people. I mean, a popular complaint is that we're forced to price our books for less than a cup of coffee ... there are PLENTY of people out there who only buy $4 luxury coffees once a month as a special treat or always brew their own at home so they won't be tempted. I haven't had a Starbucks in like three months. In that time I've bought a lot more books ... but the fact that the books are less than a coffee is part of why I can justify buying one a week as opposed to the one every three or four months the Starbucks has been reduced to. I wouldn't say this is a modern economy thing, either. My parents had a pretty tight budget all through the 80s and 90s. My grandparents had a rough go of it in the 60s. Adult life has always been about choosing to spend money on what you need rather than what you want. In fact, once upon a time, books were luxury items, possessed mainly by the well off. Now most people can afford books, and I think that's awesome. By cutting out certain expenses and going electronic, a writer can now make a larger profit margin on a $3 ebook than most authors used to on a $10 paperback. However, we also now have a lot more competition and in some ways--with so many other entertainment options--a smaller audience. But it is also easier. So writing isn't easy money. It's not even reliable money. Will raising prices fix that? 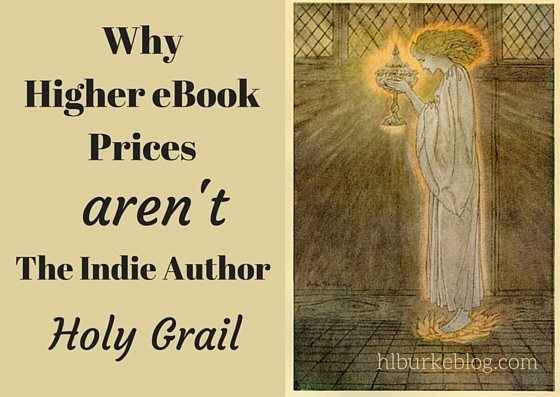 Raising ebook prices will not increase the reader's book budget. It will just decrease the amount of books they will be able to afford with that budget. And for a big name author with a loyal following, this isn't a huge problem. The reader has $10 of her budget. She can buy one $10 book by J. K. Rowling (or pick your best seller) ... or she can buy three indies. With those numbers, the indies have a fighting chance. Now if you change the math to make it one Stephen King (to mix it up) ... or two indies, the King starts looking better. One Neil Gaiman or one indie ... I'm a devoted indie reader, and I'd still be reaching for Gaiman. Knowing that the average reader isn't rich, it's actually a little humbling that they will spend money on my work at all. But what about all the time and work people put into their writing? Isn't that worth something? Isn't the heart and soul and creativity we put into each of our books worth more than $2? A. Heart, soul, and even time aren't really financially quantifiable. B. It isn't reasonable to expect a single reader to pay back even a fraction of whatever we choose to value "heart and soul" at. C. The reader isn't paying for "heart and soul." They're paying for the amount of enjoyment they will get out of the book, usually a couple of days tops, depending on the length of the book and the speed of the reader. Yeah, there's value to that, but again, it's hard to quantify, and I'd rather have a thousand readers at a dollar a book than a hundred readers at $10 a book. Now if you have achieved the name recognition needed to be someone who a reader would seek out and pay a little bit more for because they want YOUR book, not just any book, but YOUR book, that's great. Most writers, however, don't start there ... and griping that we're somehow training readers to devalue the written word by making it financially accessible is honestly kind of annoying and a little bit elitist. But next time I'm deciding whether to use my expendable income to buy a bottle of wine or an ebook roughly the same price (I drink cheap wine. I'm not ashamed to admit it), I'll probably end up toasting your health. Speaking of low book prices: Lands of Ash is 99 cents this week! Scary (or maybe not so scary) Indie Reads! Art and Money: How Do You Judge Success?